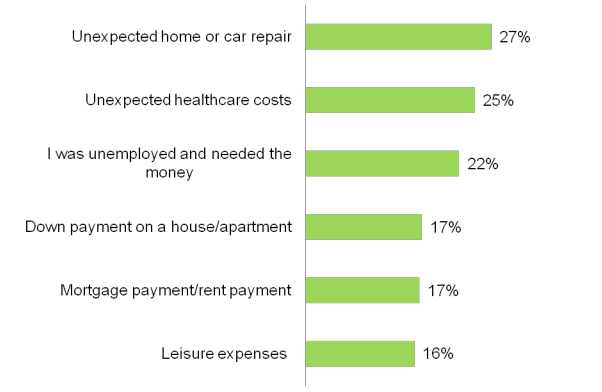 Accounting Principals polled 1,020 working Americans about the impact of the changes to the payroll tax, their spending habits, and their likelihood to work with an accountant in 2013. 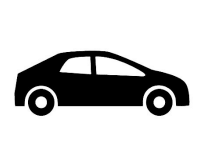 The survey was fielded between February 15th and 19th , 2013. Results have a margin of error of +/- 3.1% at the 95% confidence level. *Note: Not all respondents answered all questions. Each question is marked with its respective base size in the footnotes of each slide. The payroll tax changes that took effect January 1, 2013 have a big impact on working Americans and as a result, many are cutting back on expenses. On average, working Americans are taking home $130 less per month. As a result, their social life is suffering the most. Many have been forced to cut back on going out to bars and restaurants (20 percent) and eating lunch out (19 percent). Interestingly, nearly one quarter (22 percent) of working Americans have not cut back on their spending at all. For American workers, retirement funds are no longer just for retirement. Over a quarter (28 percent) of the American workforce has prematurely pulled from their 401(k). American workers are tapping into their savings to cover a number of expenses including unexpected healthcare costs (25 percent), home or car repair (27 percent), and needing money during unemployment (22 percent). Men (29 percent) are nearly twice as likely as women (15 percent) to cite unemployment as the reason for prematurely taking money out of their retirement fund. Interestingly, there is a notable subset of Americans who are willing to pull from their retirement funds for nonessentials. Nearly two in 10 (16 percent) working Americans said they have used their 401(k) for leisure expenses such as remodeling, buying a second home, buying a boat or vacationing. Working Americans need to spend to make it through the day. The majority (82 percent) of the American workforce buys coffee regularly to the tune of roughly $20 a week, and 89 percent eat lunch averaging more than $35 a week. Money spent on coffee and lunch by working Americans has remained consistent year over year. 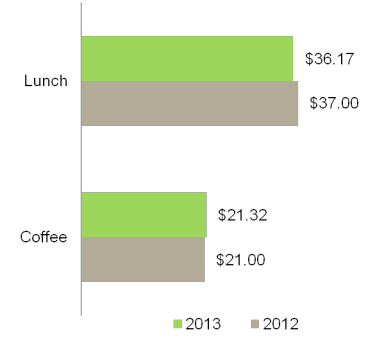 Working Americans spent an average of $21.32 on coffee and $36.17 on lunch in 2013. 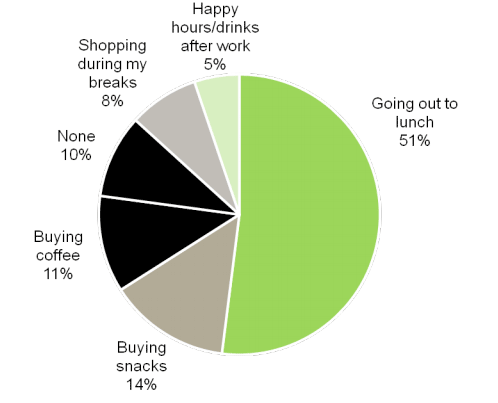 Working Americans spent an average of $21 on coffee and $37 on lunch in 2012. Younger working Americans are especially likely to buy on the go items like coffee and lunch during the work week compared to their older counterparts. Four in 10 (40 percent) working Americans age 25-34 say they spend $21 or more per week on coffee compared to just 11 percent of workers age 55-64. Working Americans age 25-34 are also far more likely to spend the most on lunch. Over four in 10 (44 percent) spend more than $41 per week on lunch compared to only 16 percent of those age 55-64. When it comes to spending at work, food continues to be Americans biggest drain on their wallet. The majority of Americans (65 percent) say going out to lunch or buying snacks is their biggest spending pitfall at work. Half (51 percent) of working Americans say eating lunch out is their biggest spending pitfall while on the job, compared to other spending on happy hours (5 percent) and shopping during work (8 percent). Snacking is the biggest pitfall for 14 percent of working Americans. Snack attacks are also more likely to affect older workers than younger – 21 percent of those ages 55-64 say buying snacks is their biggest spending pitfall at work while just 10 percent of those ages 25-34 admit to this. Americans are willing to shell out dollars to make sure they get the most from their tax returns. More than four in 10 (44 percent) working Americans will go to an accountant to prepare their taxes this year, primarily because they want the biggest refund possible. 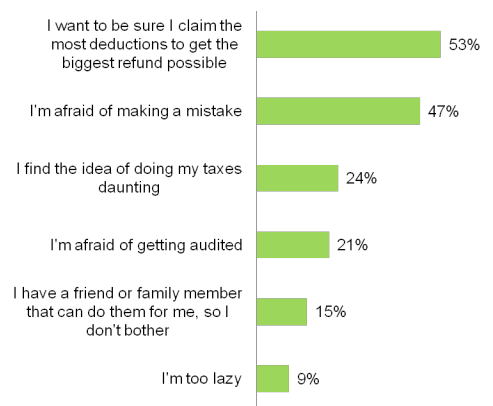 Over half (53 percent) said they won’t do their own taxes this year because they want to make sure they get the biggest refund. 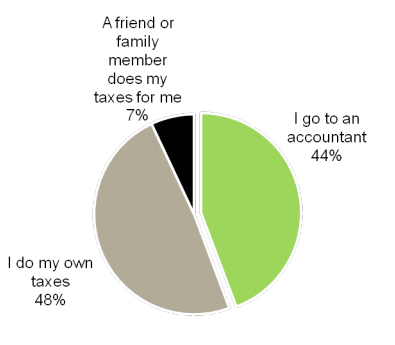 Men (52 percent) are more likely than women (44 percent) to do their own taxes in 2013, while women (47 percent) are more likely than men (41 percent) to go to an accountant. Tread carefully when asking coworkers to buy stuff on behalf of your kids; not all working Americans are happy to open their wallets on the job. Americans have a love-hate relationship when it comes to supporting your kid’s fundraising pursuits. While nearly one quarter (24 percent) of working Americans will buy anything your kid is selling such as cookies, wrapping paper and popcorn, 27 percent hate being asked to buy products from your kids because they feel pressured to buy it or they don’t need the product. The remaining 49 percent of Americans will only consider buying a product if they like it. Income plays a role in working American’s willingness to buy from colleagues. Those at lower income levels are less willing to buy a product if asked. Only 16 percent of those who make between $30K-$50K say that if they are asked, they will buy it versus 28 percent of those earning $75K-$100K and 25 percent for those making $100K or more. Working Americans are taking steps to deal with a reduced paycheck. On average, working Americans are taking home $130 less per month as a result of the payroll tax changes. Men (7 percent) are twice as likely as women (3 percent) to cut back on contributing to their retirement since their paychecks were reduced by payroll taxes. Women (16 percent) are twice as likely as men (7 percent) to cut back on spending money on clothes as a result of the newly instituted payroll taxes. Which of the following, if any, have you cut back on MOST since your paycheck was reduced due to payroll tax changes on January 1, 2013? Nearly one quarter (22 percent) of working Americans have not cut back on their spending at all. There is a notable subset of Americans who are willing to pull from their retirement dollars for nonessentials expenses. Which of the following, if any, are reasons why you prematurely took money out of your retirement fund (i.e. 401(k) or IRA)? Which of the following, if any, is your BIGGEST spending pitfall at work? The majority of Americans (65 percent) say going out to lunch or buying snacks is their biggest spending pitfall at work. The majority (82 percent) of the American workforce buys coffee regularly to the tune of roughly $20 a week, and 89 percent spend an average of more than $35 a week on lunch. 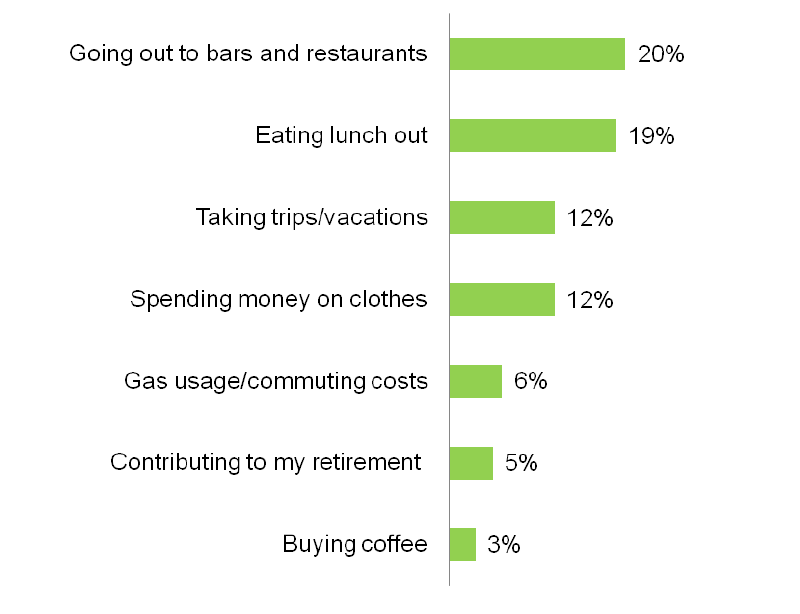 Younger working Americans are much more likely than their older counterparts to spend $21 or more per week on coffee. 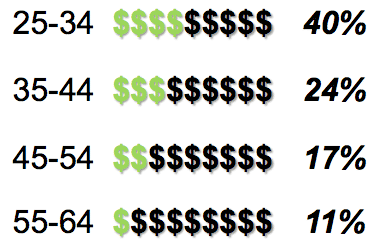 How much money do you spend per week on…? More than four in 10 (44 percent) working Americans will go to an accountant to prepare their taxes this year, primarily because they want the biggest refund possible. 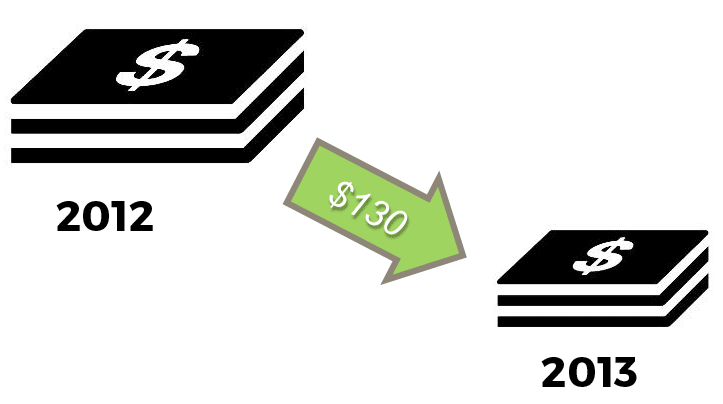 How do you plan to/did you prepare your taxes in 2013? Why didn't/won't you do your own taxes in 2013? Tread carefully when asking coworkers to buy stuff on behalf of your kids; Americans have a love-hate relationship when it comes to supporting your kid’s fundraising pursuits. Nearly one quarter (24 percent) of working Americans will buy anything your kid is selling, such as cookies, wrapping paper and popcorn. Nearly half (49 percent) of working Americans will only consider buying it if they like the product. However, 27 percent hate being asked to buy products for your kids because they feel pressured to buy or they don’t need the product. Income plays a role in working Americans’ willingness to buy from colleagues. Those at lower income levels are less willing to buy a product if asked. Over a quarter (28 percent) of the American workforce has prematurely pulled from their 401(k). Nearly one in six (16 percent) working Americans said they have used their 401(k) for leisure expenses such as remodeling, buying a second home, buying a boat or vacationing. 8 Reasons to encourage employee vacations. Accounting Principals polled 507 recent grads with a four-year degree about their debt, salary, disposable income, and finance knowledge as a recent graduate.